The trigger was high tuition costs that drove students and their families into debt. There were coordinated marches in all major cities. At some universities students took over buildings. The marches took on almost a carnival atmosphere with students engaging in “kiss-ins” and pillow fights.More than two thirds of the population supported the student movement and its demands for education reform. The students consistently rejected the government’s attempts to appease the protesters as grossly insufficient. Although most of the demonstrations were peaceful, some protestors wanted more direct confrontation with the police. Masked protesters armed with stones clashed with police forces equipped with riot gear, tear gas, and armoured vehicles with water cannons. The harshness of the government crackdown drew international criticism. More than two thirds of the population supported the student movement and its demands for education reform. The students consistently rejected the government’s attempts to appease the protesters as grossly insufficient. Their goal was free university tuition. President Sebastian Piñera, the first conservative president since the 1988 plebiscite that ended General Augusto Pinochet’s dictatorship, saw his ratings plummet to the lowest of any leader in the post-authoritarian era. Ordinary Chileans had made clear that they wanted to see changes in their society. This set the stage for Michelle Bachelet to run for election in 2013. She was previously president from 2006-2010, but Chile’s laws prevented her from running for a second consecutive term. Bachelet was backed by the Nueva Mayoria (New Majority), a center-left coalition made up of her own Socialist Party, the Christian Democratic Party, and the Party for Democracy, among others. After falling just short of an absolute majority in the first round of elections, Bachelet won handily in the runoff, taking home over 62 percent of the vote. Bachelet had been given a clear mandate. The government put together a package that would raise corporate income taxes from 20 percent to at least 25 percent and close tax loopholes for companies and wealthy business owners. The changes promised to bring in an estimated 8.3 billion dollars each year. The government pledged to put half of these funds toward providing free education for all Chileans by the year 2020 and to roll back the for-profit schools that emerged during Pinochet’s dictatorship. The remainder would be used to improve the health care system and other social programs. On Sep. 28, Bachelet signed the bill into law. Beyond raising the corporate tax rate, the reform targets the profits of large businesses and their owners in other ways. The law eliminates the FUT (Taxable Profit Fund), a provision that allowed businesses to set profits aside without paying taxes on them— funds that at last count held 270 billion dollars. The reform also addresses the owners of these businesses. In years past, wealthy business owners enjoyed incentives to avoid withdrawing all of their income from the company’s profits so that they would pay the more favourable corporate tax rate of 17-20 percent compared to nearly 40 percent, the highest personal income tax bracket. However, the owners would then find ways for the profits to make their way back into their own pockets, either legally or illegally. The tax reform therefore opened up a new range of taxable income, money previously out of the government’s reach. There is some concern that the tax reform will drag down the already faltering Chilean economy. Opposition groups claim the new rules will hurt future investments, and this seems to resonate with the public — Bachelet’s approval rating has dipped below 50 percent. However, Justice Minister José Antonio Gómez insists that on the contrary, with more than 50 percent of the 8.3 billion dollars going toward implementing free, quality education, it will in turn result in increased productivity. Even if productivity fails to rise immediately, the political support of thousands of households with college students who see their tuition bills cut in half or more is likely to create a broad constituency to keep core elements of the tax and spending package in place. Although many of the protests of 2011 — the year of Occupy Wall Street — have faded, Chilean students and workers managed to win many of their demands. This experience offers important lessons for popular movements struggling for similar goals around the world. By focusing on tangible demands, making broad partnerships, and linking to the larger platform of economic inequality, Chilean protesters changed the rules of the game. Edited by Kitty Stapp. This story originally appeared on Foreign Policy in Focus. MOUNTAIN VIEW, CA—(Marketwired – Dec 5, 2014) – A wedding cake slice from the 2011 wedding of Prince William, Duke of Cambridge, and Duchess Kate Middleton, Duchess of Cambridge was sold today at Julien's Auctions in Beverly Hills for $6,000. The buyer of this romantic slice of history was Gee Chuang, cofounder and CEO of Listia.com, an online marketplace startup in Silicon Valley. Chuang plans on giving away the $6,000 piece of wedding cake on Listia in April of 2015 to celebrate the royal couple's fourth wedding anniversary and pending birth of their second child. 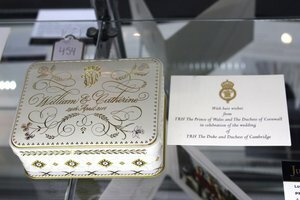 The piece of wedding fruit cake came in a special collector's tin wrapped in greaseproof paper that was given to guests at the royal wedding. Although the wedding cake still smells quite tempting, Chuang has no plans on having even a small bite. The $6,000 slice of cake will be well preserved in a cool temperate controlled environment until the cake is given away on Listia's online marketplace. Members will be given an equal opportunity to acquire the cake without ever having to be rich, royal or spend any physical money on the cake itself.